art. love. pursuit of knowledge. 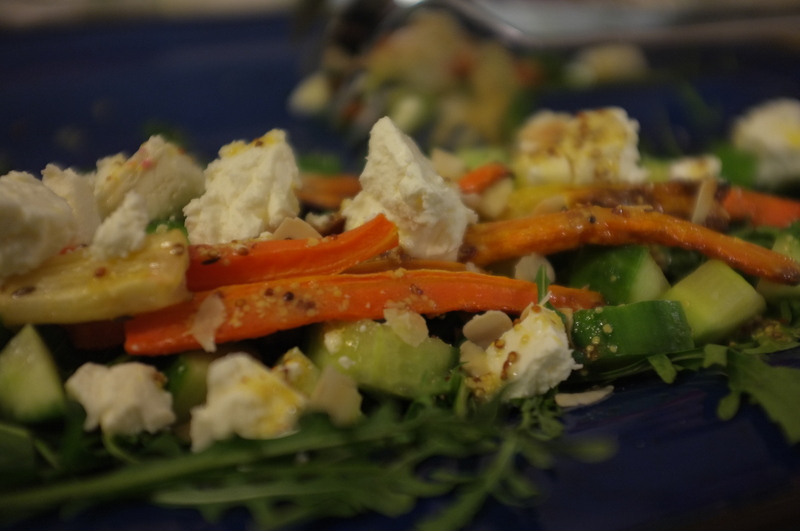 We had this as a starter salad, and I love it: the dressing is sharp, the carrots are aromatic, sweet, and flavourful, the rucola is slightly bitter, and the feta is salty. The recipe is a modified version of what I saw in the BBC GoodFood February 2017 magazine. Heat oven to 200˚C. Toss the carrots in 1 tbsp oil, the cumin seeds, and salt. Spread out on a baking tray and roast for 30-35 mins until soft and charred around the edges. Meanwhile, whisk together the remaining oil, the lemon juice, and mustard. Once the carrots are cooked, stir through all the remaining ingredients, then toss through the dressing to serve.